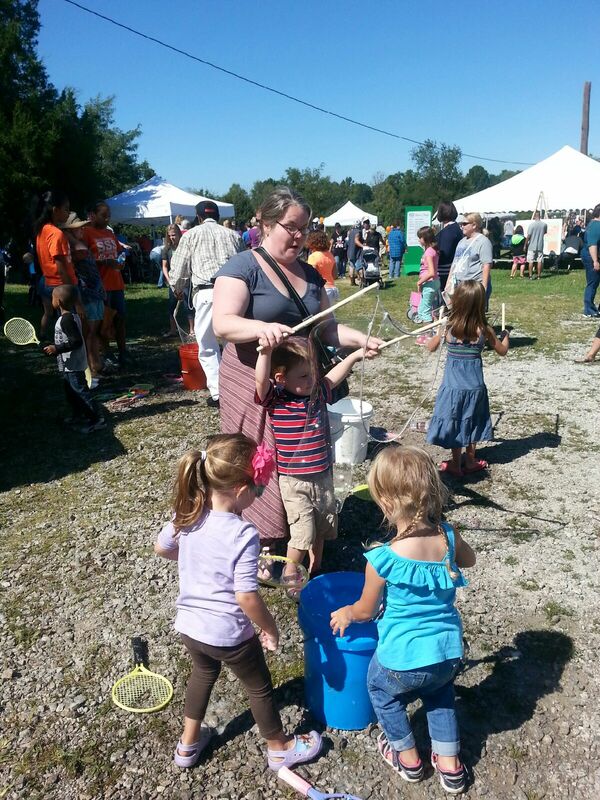 This past weekend, Josephine Sculpture Park (JSP) celebrated its 5th birthday during its 2014 Fall Arts Festival. They couldn’t have asked for a better day. It was hot but breezy, and the goldenrod was at peak bloom. The atmosphere was just like a 5-year-old’s birthday party with bubbles, balloons, face painting and edible delights. Guests were also treated to hands-on art experiences, including metal relief sculpture, glass blowing, tie dye, pot throwing, paint rockets and other fiery, messy fun. Bubbles. How does soap and water get so messy? I took my 3-year-old son, a friend and her baby to experience the momentary enjoyment, but also to take part in something lasting. We went to see and participate in Magellan, a collaboration among JSP, Governor’s Arts Award recipient Latitude Artist Community, the Expressive and Wellness Program at Employment Solutions and StudioWorks at Zoom Group. 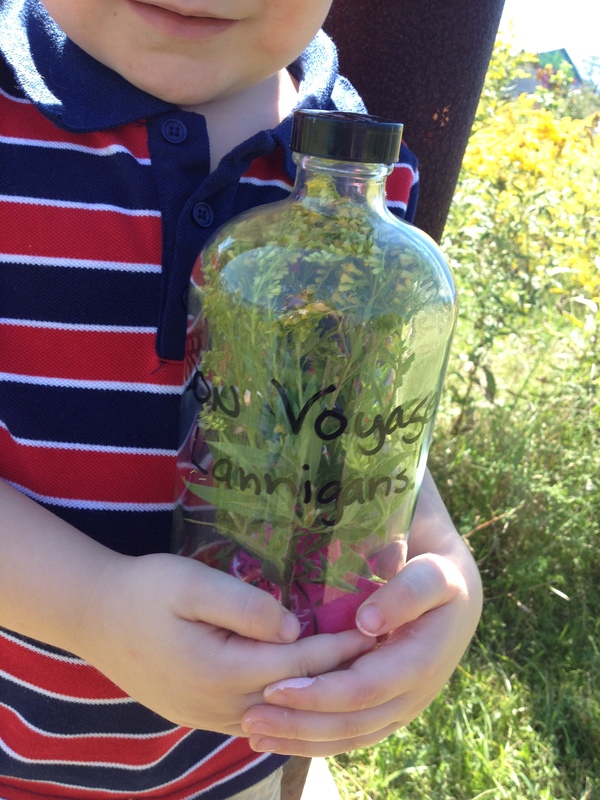 On JSP’s eastern ridge, Latitude artists handed each new voyager a bottle and asked them to put something in it that was meaningful to them and decorate the interior. When the bottles were complete, they were capped and displayed together. What happens later is the transcendent part. The bottles will be placed into tubes and sealed with Plexiglas. The tubes will then be placed in a boat-shaped hole dug into the ground, which will be filled with concrete. Once the cured concrete boat is pulled out of the ground, it will remain on display at the park with the bottles visable in the tubes. According to Latitude, “The focus of this project is on relaying what is the core of our essence, what are the most profound aspects of ourselves that we would like to share with the Planet.” In essence, we are all human-shaped vessels, carrying around our own message, and we are all afloat in a greater vessel together. 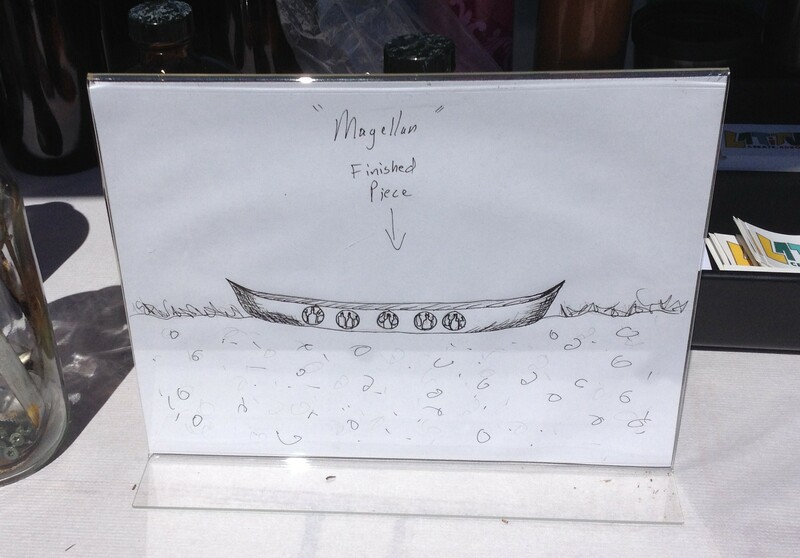 A concept drawing of Magellan. When we left, the eastern ridge was lined with bottles full of things — things with personal meaning. All held messages sent to no one in particular — just anyone who will find them, see them or hear them. Not every message in a bottle begs for rescue. Most are just something that needs to be said to someone, and that “someone” can be anyone willing to look in the bottle and listen. Like Latitiude or JSP on Facebook to follow the concrete boat of bottles as it completes the creation journey. It’s hard to believe Kentucky Crafted: The Market is right around the corner! While artisans across the state make final preparations for the show, the Kentucky Arts Council has been working with local arts organizations to ensure this year’s event will be fun for an individual or the whole family. A part of The Market for almost 15 years, the hands-on activities are a chance for people of all ages to find their own creative side as they explore the ways in which art overlaps science, literacy, and even nature. Working with the Louisville Visual Arts Association, Market-goers will have the opportunity to create their own animals and characters based on the work of beloved children’s author Eric Carle. Don’t recognize the name? Maybe you’ll recognize the titles. Carle’s work includes “Brown Bear, Brown Bear, What Do You See?” and “The Very Hungry Caterpillar,” a book about the fun, yet massive diet of a caterpillar as he transforms into a butterfly. This simple project allows participants to get as involved as they choose, making it the perfect pit-stop during your time at The Market. For kids — and adults! — interested in building, the Lexington-based Living Arts & Science Center’s (LASC) Architecture of Life presentation will include an exhibit that illustrates how structures that exist in the natural world often become inspiration for architects designing structures in the modern world. Utilizing the LASC’s designs for an upcoming building addition, the exhibit will showcase the creative process that takes place from conception to construction. Opportunities for all ages to build with blocks of various architectural styles, and an area to design and create pop-up structures, will be available. Kids — and kids at heart — can also build mini abstract sculptures out of reclaimed Styrofoam with the Josephine Sculpture Park (JSP), based in Frankfort. Based on workshops that are conducted at JSP throughout the year, each activity is appropriate for people of all ages and abilities. Participants will meet and work alongside local artists to create their own work of art to take home. They also can participate in creating community bee hive murals, sponsored by Bee Friendly Frankfort. Examples include painting and collaging floral landscapes on beehives that will be installed at the park, and creating whirligig pinwheels from recycled plastic water bottles. Finally, courtesy of Explorium of Lexington, guests will have a chance to create mixed-media artwork while exploring the human body’s five senses. By experiencing the senses through a creative process, participants will discover how much we rely on our bodies to send our brain important signals. In addition to creating original artwork, participants will test how well they know their five senses through a series of sensory stations! If you’ve exhausted your entertainment options thanks to recent snow days, Kentucky Crafted: The Market 2014 is the perfect option to explore your artistic side!